"Apple quietly launched a lower-price 21-inch iMac on its Apple Store for Higher Education - seemingly in time to capture some of the lucrative back-to-school market. My question: Does anyone still buy desktop computers for students going to college?" I'd say no. 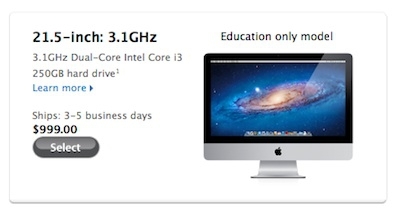 These days I can't imagine students wanting anything other than a laptop. And this is a scaled down version so for $200.00 USD you can get a much better machine. Faster CPU, double hard drive space, double RAM and double the video RAM. I'd spend the extra $200.00 USD to get that much more capability, wouldn't you?